Set in the 2030’s, the initial premise mirrors John Carpenter’s Escape from New York; only this time New York is a space station and instead of saving the President our hero is tasked with saving the President’s daughter. If you can get past one or two elements of the story line that are seriously improbable, and you like fast-paced action with a touch of humorous one-liners, you’ll like Lockout. Joseph Gilgun is terrific and vivid as the sociopath; Vincent Regan delivers a strong performance as his saner and focused brother, and Maggie Grace as the President’s daughter also delivers solid performances. Peter Stormare, Tim Plester and Jacky Ido were also solid and believable. 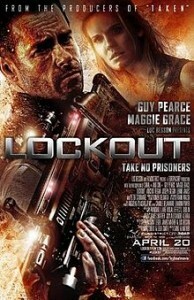 Taking into account the genre, what the movie is supposed to be, and the quality in which they present it, Lockout is a solid 3 and a half stars.